A) Custom work is exciting, and thanks to modern technology it's possible to do this online wherever you may live. It's a fun way to make a personal statement in gold or silver, with jewelry that is meaningful. Wearable Art that tells a story. It is often surprisingly affordable. It's a very personal and uniquely collaborative process. You take part in the creative process. Let me tell you a little about my approach so you can decide if this is for you. Some people have a clear idea of what they want to create. You have seen something or owned a piece in the past. Maybe you have a photo of an animal or a sculpture you can picture as a ring or pendant. Others need more input to have things gel. It helps to look at finished jewelry, magazines and store windows for inspiration. Visit my online store or my portfolio for ideas. 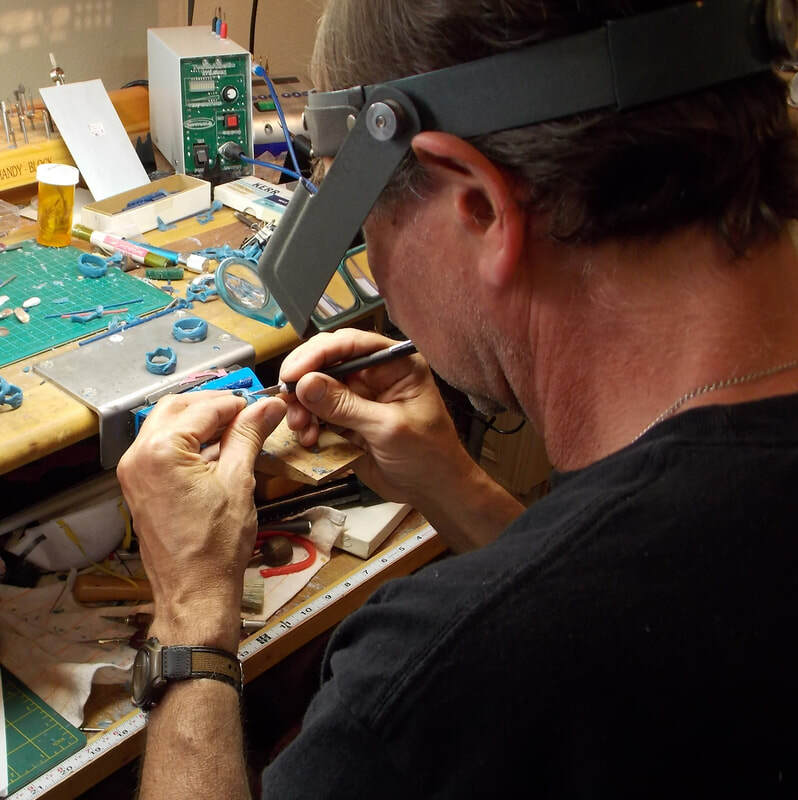 Finally, speak to a jewelry designer, an artist who knows the possibilities and mechanics of jewelry making. In my Process we will talk, by phone or face to face, and together refine the idea. I will guide you through the design and modeling process step by step and consult with you along the way. See my reviews on Etsy and Square for comments from happy clients. 1) Contact me with your design questions and ideas. We'll explore the idea until we have some clarity. 2) Once I have a clear idea of what you want, I will follow with a simple sketch, an estimate and a custom listing for you. 3) Upon approval you make your first 1/3 payment. 4) I follow with a detailed sketch. 5) When you approve the sketch, I carve a wax model. 6) I cast and finish your custom order. 7) You make the final 1/3 payment and I ship your creation! You can cancel your order any time before shipping. Before the wax is carved you get a full refund. If you cancel anytime after wax carving and before shipping I will refund all but the first payment. After the jewelry is shipped it is non-refundable. Please contact me if you are not delighted with any aspect of our transaction. I believe that there are few problems that can’t be resolved with a little goodwill and creativity.